I’d been looking forward to seeing the Giant Sequoias for a very long time – ever since one first caught my eye in a magazine I bought some ten years ago. There was a picture of a person perched on top of an enormous tree stump, leaning back with their legs comfortably crossed, gazing up at the canopy as though sat on their own private balcony. Before then, I hadn’t known trees could grow so impressively tall. Inspired by the image, I knew that one day, I had to go see these giants in real life. Native to California, the Giant Sequoias can reach to approximately 300 feet in height and 35 feet in diameter. They now only grow naturally in a few select locations, including Yosemite National Park with its three groves — Mariposa, Merced and Tuolumne. Due to the distance from San Francisco, I decided to take this trip as part of a three day camping tour. From the city, our minibus took us through the Central Valley and on to Yosemite. The sky was absolutely dazzling, the Californian sun beating down relentlessly upon us. As we made our way toward the grove and stepped into the Sequoias’ shadows, the brightness became more bearable. After staring slack-jawed for several minutes, we followed the path, craning our necks to gaze at the biological skyscrapers surrounding us. Among the verdant trees stood one that was dead, its empty shell reaching toward the sky like a pair of outstretched arms. An archway had been carved into its base, allowing us to walk straight through it. 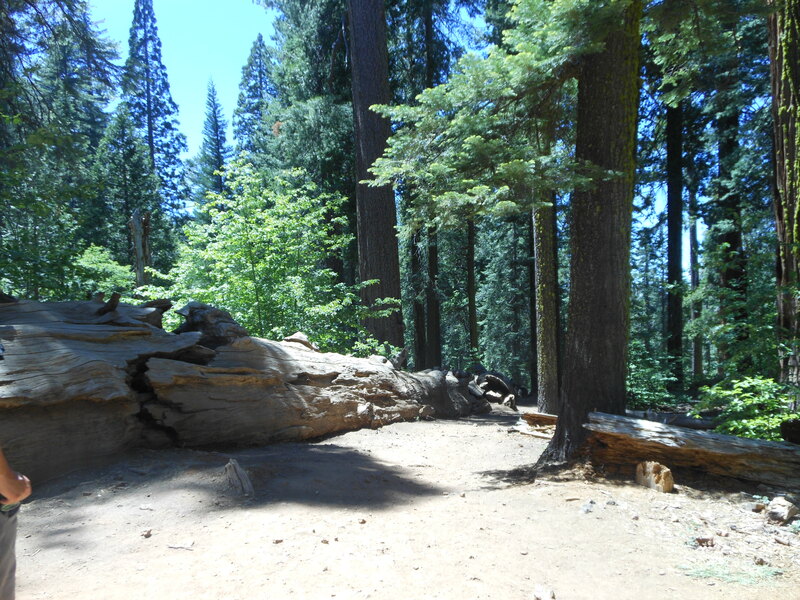 Soon, our trail took us to a Sequoia which had been completely toppled. Fractured from the impact, it lay across the dusty earth like a collapsed obelisk. At the lower end, its immense roots protruded horizontally, surrounding a shadowy passage which led inside the trunk. It was a shame, to see such a magnificent tree felled, but it did not detract from the experience of getting up close and being able to fully appreciate its size. We were like children in an adventure playground – scrabbling on to the tree, walking across its top, crawling through its hollowed out centre. It felt surreal, shuffling into the dark tunnel that bored its way into the trunk. Having imagined all sorts of creepy crawlies living inside, I was pleasantly surprised by the lack of insects. 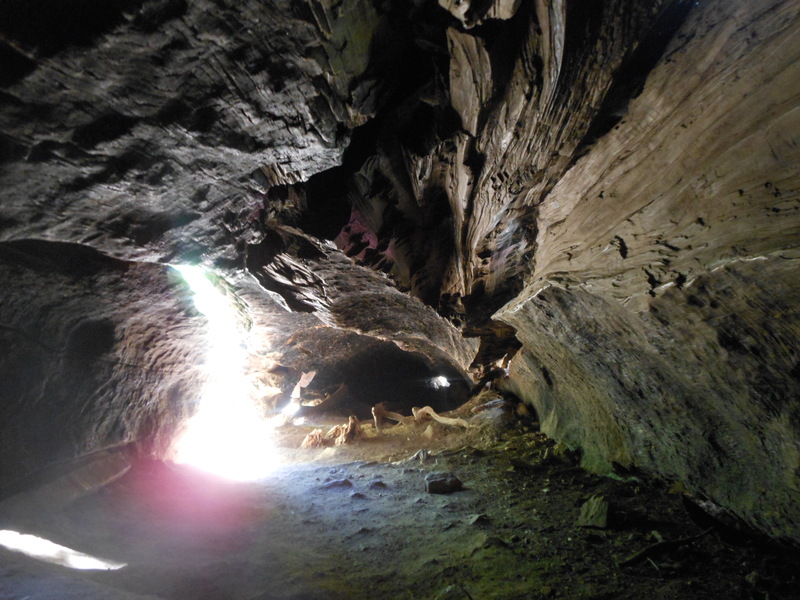 Sunlight spilled through the cracks in the wood, giving me an entirely new perspective of the Sequoia. After all, how many people can say they have ever been inside a tree? It’s difficult, to fathom just how large the trees are without something nearby to gauge their size. So when our guide found two pine cones to hold up for comparison, I couldn’t resist taking a photo. 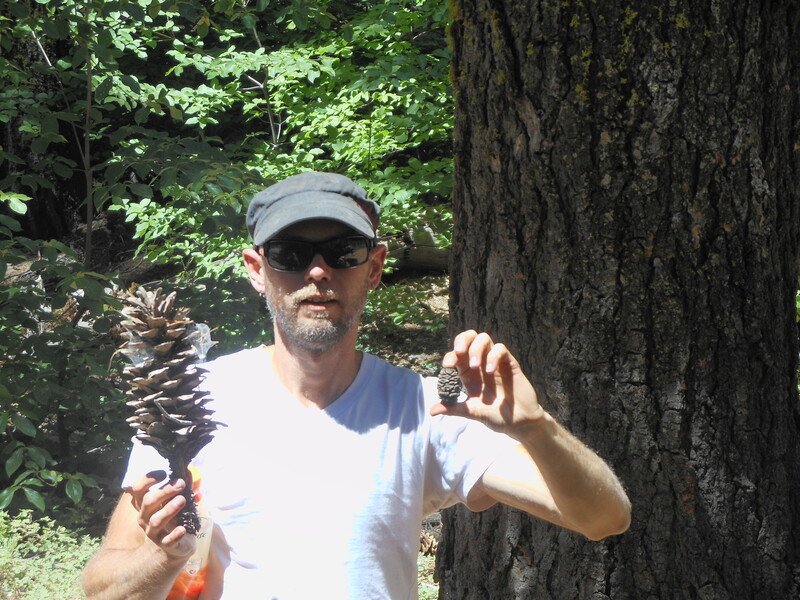 In one hand was an ordinary pine cone, in the other, one belonging to a Giant Sequoia. It was enormous – the mother of all pine cones. After our trip to the grove, we headed further into the park and explored its more tourist-orientated centre. 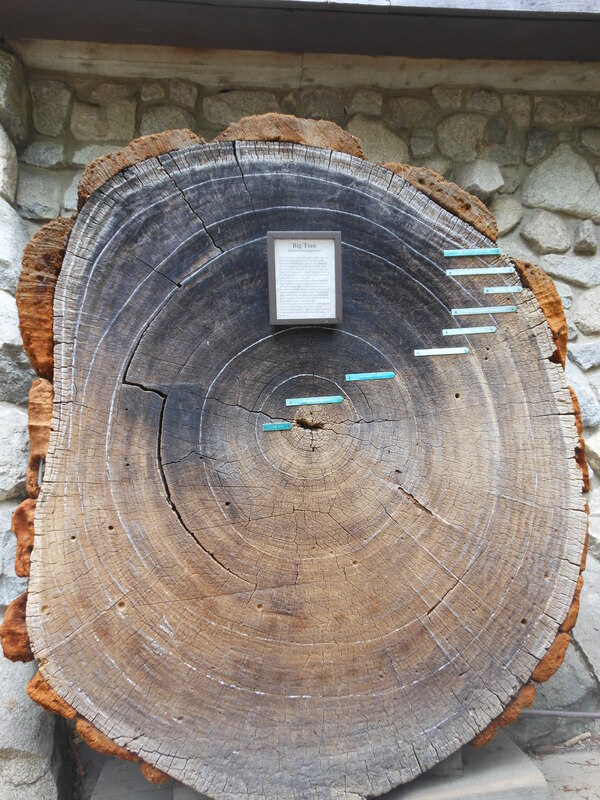 Outside the Yosemite Museum, we came across a display of a Sequoia’s cross-section. I noticed that several of the rings had blue markers. Looking closer, I realised they were dates – milestones in human history. There was the Battle of Hastings in 1066, the signing of the Magna Carta in 1215, the Declaration of Independence in 1776 – the life of this tree had spanned over a thousand years. 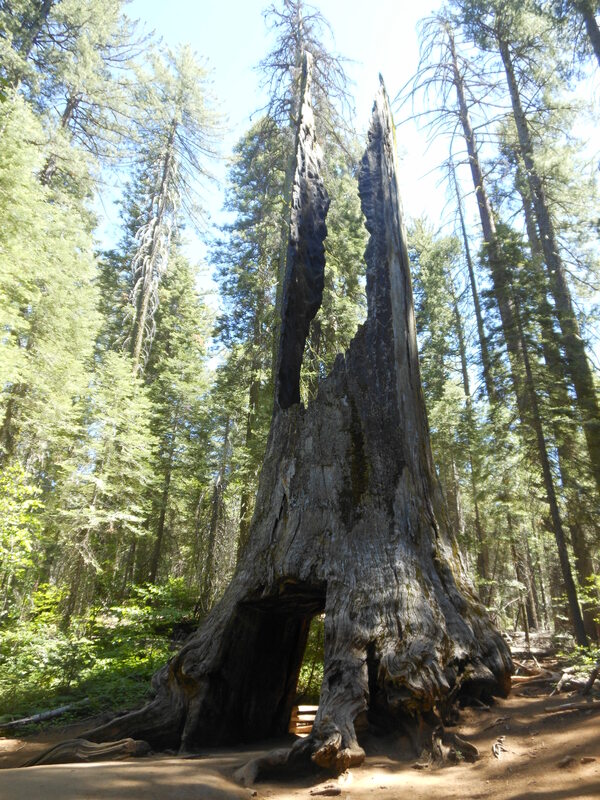 As incredible as I found the Tuolumne Grove, it was only months afterward that I discovered it contained the smallest Sequoias. For the real giants, I needed to head further south to Sequoia and Kings Canyon National Park. 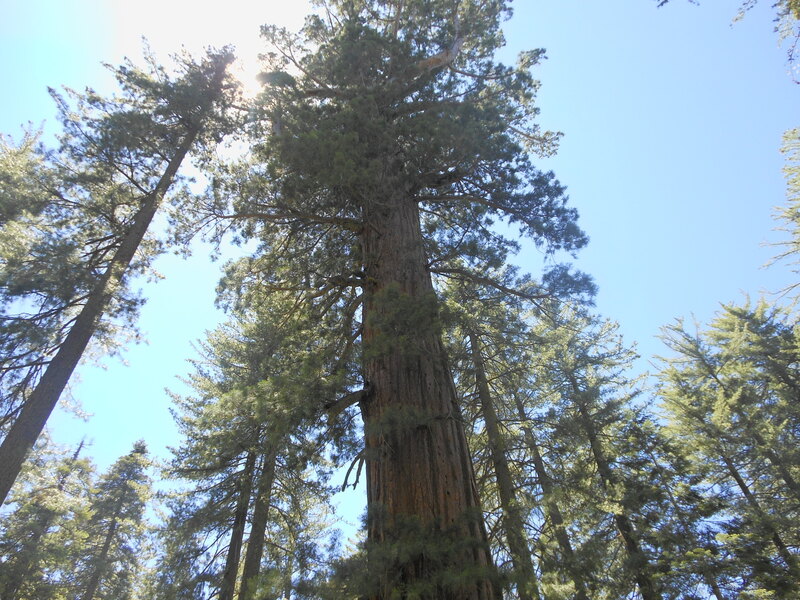 Here, visitors can see the famous ‘General Sherman’, one of the largest living trees on earth. 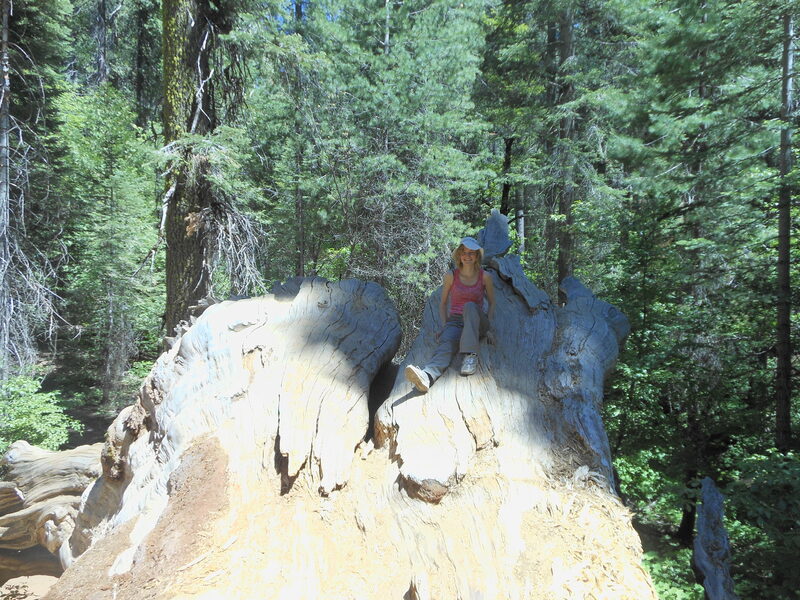 As there are very few of these truly colossal trees left, its a trip that I believe would be well worth taking.